During the course of the project, we held several workshops to formally introduce and conclude the project. These informal events combines short presentations and open conversation in order to stimulate and inform our ongoing research. An afternoon workshop run in conjunction with the AHRC ‘Diasporas, Migration & Identities’ initiative and the Postcolonial Research Group. 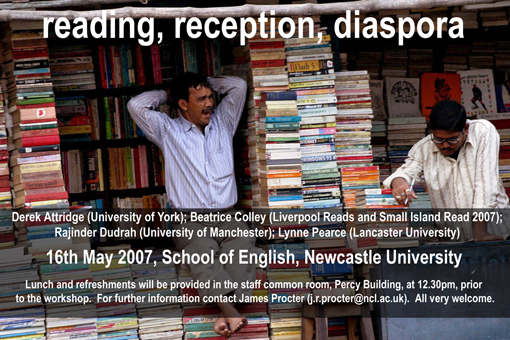 This informal seminar marks the close of the AHRC-funded ‘Devolving Diasporas’ project in June 2010. It has been arranged around the visit of Dr Michael Bucknor of UWI, Jamaica. Michael has been working with book groups in Jamaica, and the material he delivers on 12 May will represent the final sample of data collected over three years as part of a transnational study of readers and reception drawing on book group conversations across the UK (from Cornwall to Glasgow), in India (Delhi), Trinidad (Port of Spain), Nigeria (Kano and Lagos), and Canada (Ontario). The seminar will consider some of this book group data alongside a much broader and interdisciplinary series of papers that range across cinema, radio, book and television audiences. As we move between Algeria, North America, Pakistan, Jamaica, and Britain; between theoretical, textual and real audiences; and between listeners, readers and viewers there may be few points of commonality in our analysis of modes of reception. In this way perhaps the seminar will reveal the categorical impossibility of ‘the postcolonial audience’? On the other hand, it may reveal surprising points of sympathetic contact. In either analysis, the event will have achieved at least part of its aim, which is, through concrete, discrete and diverse research to start to think speculatively about what the term ‘postcolonial audience’ might mean. What does postcolonial studies stand to gain or lose by turning its attention to audiences? What sorts of methodology would be required? How do we access and analyse audiences designated ‘postcolonial’? 4.20 - Michael Bucknor, "Audience Authority: The Question of Context and Credibility in British/Jamaican Diasporic Narratives"